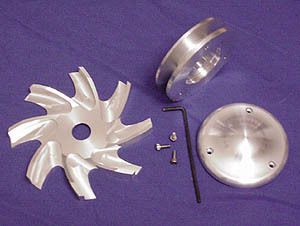 This performance three piece Billet Alternator Pulley Set is CNC machined from Aircraft grade Aluminum and includes a billet fan, drive pulley and nose cover. 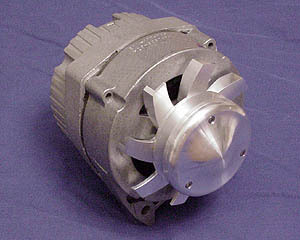 The unique design and trademark precision of these parts offer many advantages over a stock Alternator Pulley for any application, being a Sunday driver or a weekend racer. Stronger Than Steel - The unique construction of this pulley set using Aircraft grade aluminum yields a stronger unit. It will not bend or run out of true. Better Cooling - The redesigned billet machined fan is not only stunningly beautiful, but will deliver more cooling air to the alternator. This is especially important with modern upgraded alternators delivering more than twice the charging output of the stock high output alternator option. Improved Belt Tracking - The billet machined drive pulley is designed with a slightly deeper belt groove to help high speed belt tracking. This improvement will benefit performance applications where the belt tends to leave the alternator pulley during high RPM loads. Will Not Rust - A stock steel pulley will rust if not driven often and this will lead to damaged, torn or frayed belts. Always Looks Great - No rust or paint to flake or chip off. 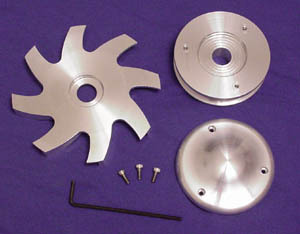 Beautiful machined surface will keep its great looks for the life of the pulley. The CNC machined drive pulley nose cover adds an elegant touch to finish this set and conceals the large nut that is visible on the end of the stock pulley. Will Run True - The groove face of the pulley is +/- .001" and run out is +/- .001" Belt groove concentricity is less than .001". 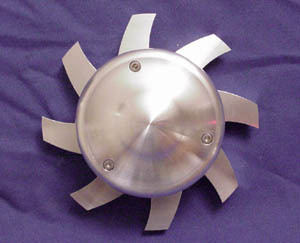 The axial center line of the Alternator Pulley Set is within .001" of the edge of the pulley. These pulleys are over six times better than a stock pulley. A stock pulley can be out by . 060". These billet machined pulleys will run so true so your belt tracking will be better than you ever imagined and your belt drive system will be noticeably quieter. Smoother Finish - The fine machined surface of the pulley v-groove will not nick or wear a belt like the stock steel pulley can. This will increase belt life and belt tracking.